Provide comfort for the family of Kent Lovelace with a meaningful gesture of sympathy. Gaffney -- Mr. Kent Hale Lovelace, 62, of 128 Rainbow Drive, crossed the finish line of eternity on Saturday, March 16, 2019, at Spartanburg Regional Medical Center. Born in Boiling Springs, NC, he was the husband of Julie Phillips Lovelace and the son of the late John Bunyan Lovelace Jr. and Eunice Wiggins Lovelace. 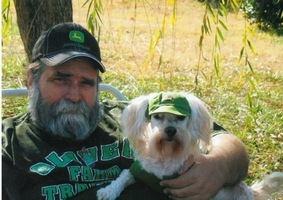 His dogs were his babies, but he also loved racing and tractors. Kent was a member of the Broad River Antique Power Association and he set up his "Farm Daze" booth regularly at flea markets and tractor shows. In addition to his wife, Mr. Lovelace is survived by two daughters, Tina Lovelace of Shelby, NC and Ashley Michelle Lovelace of the home; two sisters, Abbie Anthony (Max Lail) of Shelby and Ann Holland (Dan) of Dallas, NC; one brother, Jimmy Dave Lovelace (Judy), of Shelby; three grandchildren, Kenny, Chloe, and D'Andre Lovelace; numerous nieces and nephews; and special friends, Mike and Jaymie Dobbins, of Gaffney. The family will receive friends on Saturday, March 23, 2019, from 12:30 PM - 1:30 PM at Park Hills Baptist Church. Funeral services will immediately follow at 1:30 PM with Dr. Paul Noe officiating. Interment will be in Trinity Baptist Church Cemetery of Moorseboro, NC at 3:30 PM. Memorials may be made to Kent Lovelace Funeral Fund, c/o Gordon Mortuary of Gaffney, 211 E Frederick St, Gaffney, SC 29340 or donations may be made online through his Book of Memories. The Gaffney location of Gordon Mortuary is serving the Lovelace family. To send flowers in memory of Kent Hale Lovelace, please visit our Heartfelt Sympathies Store. We encourage you to share your most beloved memories of Kent here, so that the family and other loved ones can always see it. You can upload cherished photographs, or share your favorite stories, and can even comment on those shared by others.